Normally the street lighting is controlled by some central authority. I have had the opportunity to try out a different strategy by installing a switch on the lighting in a street. The introduction of this switch was from my point of view more an empirical investigation than a proposal for a new structure of behaviour. The background for the experiment was the question of how and to what extent the local residents would be interested in taking part in the creation, transformation, and control of the common urban environment. Moreover the experiment was done to investigate which complex implications the creation of this new situation would bring about. The occasion for the experiment was a workshop initiated by the local council of Vejle, a provincial town in Denmark. They had invited a group of artists and architects to take part in a workshop on the urban planing of the future. What interested me was making open-ended plans for people to settle over time in their own way and work against macro-plans imposed on entire areas in one go. But my main concern was whether the local people felt any interest in taking part in the creation of the common urban environment. That was why I suggested we should do some empirical work, as a point of departure. The idea of the switch was put forward. The local council was hesitant but agreed to make the test. I chose a dead end street as the test area. 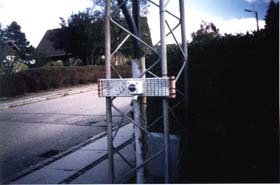 The switch was installed by the entrance to the street. The technical department of the council came with a crane to make it possible to rewire the overhead wiring of the street lights. The operation was fairly easy. In the street there were approx. 40 households and a flyer with information on the new facility was distributed. The flyer was posted in the newsagent around the corner and a notice was published in the local paper. When I was invited to take part in the workshop, I was reluctant to take part. I was not sure whether I, as an artist, should engage with and work for the state or some local government, because at the bottom line their agenda is always productive and economically founded. But I couldn�t really know how it would work before I had tried it. When we arrived the people from the council were very exited. They said we should feel free to ask for whatever we wanted - we should just use the facilities of the council. When I then asked whether they would help me installing a switch on the street lighting somewhere in the town, it was clear that this went beyond their expectations of what an artist could ask for. Everybody got nervous and they, I believe, thought I was pulling their legs. They agreed to realise the installation, but it had become fairly clear that their conceptions of artistic practice were solely ornamental and not structural. There was only one switch installed for the entire street. It wasn�t just a functional intervention, but demanded a renewed social organisation around the new variable introduced into the local environment. As a point of departure the street lights were switched on. The first evening the switch was working, I went to see what had happened. It was late evening and when I arrived the lights were still on. It didn�t really surprise me that nobody had broken the ice and switched them off. Of course I didn�t know whether somebody actually had switched off the lights and then somebody else had reacted by switching them on again. And I didn�t know whether some kids had been playing with the lights. Of course I had to try myself. When I switched the lights off first it became very dark. But slowly the landscape around the town became visible; the hills as well as the sky and the stars were suddenly present. The space had changed and it was, in a concrete way, making me realise how the street lights influence our perception of space in the city. They light up, yes, but reduce the perspective and the scale of the surrounding space. And the switching off of the lights gave rise to some poetic qualities I hadn�t exspected: the hills, the sky, the stars. On day 4 I went to the test area with the intention of interviewing a couple of the residents. First I went to a house where the people were in the garden. I asked them whether they had noticed the new opportunity with the switch. The owner of the house, a man in his fifties, said that they had noticed the switch and they weren�t against the idea, but in case it should become permanent the council should guarantee a clamp down on crime, because burglars thrive in the dark. He viewed the switch in terms of lost security and control. I had noticed the floodlights with sensors dotted around in the bushes when I entered the garden. Then I went to a more modest looking house. The woman who opened the door was in her sixties or seventies. She told me that they knew of the switch, but they hadn�t used it yet. They intended to use it but they hadn�t arrived home late. If they arrived home late one night they would for sure switch off the lights after them. She said it in a similar way that she would probably tell me how she always switches off the lights in the bathroom after use. She viewed the switch in terms of economy. The switch had triggered a complex social situation. Diverse interests were at work. The discussions over the fences and in the street had already begun. The workshop concluded with a presentation of the various plans, suggested by the different groups. The group I was a part of suggested a plan where people should settle over time. An area should only become fully developed after 100 years. The lay out of the infrastructure should evolve synchronous with the settlements and our project encouraged that people develop the tracks and dirt roads needed themselves. Basically we outlined the development of the future town as a game with certain rules, but without a fixed plan. The people from the council were now convinced that we were making fun of them and everybody became even more nervous. Some people from the National Arts Board, which should evaluate the projects, looked at all the proposals. They decided to nominate our project to be realised. I haven�t heard anything from Vejle since and I don�t know whether the switch is still there or whether they dismantled it the day I left. I guess they did. The workshop took place in 1997.